WAR! What is it good for? The best Hulk storyline this side of 1998, that’s what. Last issue brought us the opening shots, and the fierce revolt we’ve been waiting for breaks out across Sakaar in "Planet Hulk: Anarchy, Part 2." 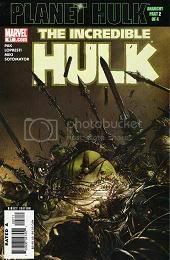 The Red King rains fire down on his subjects in Crown City, Hulk and his allies invade the Maw, and dissension brews in the ranks as the Hulk grows unsure of how much blood he’s willing to spill. This last aspect of the issue is my favorite. While reveling in battle and still close to his "warbound" companions, we see the Hulk questioning his own thirst for revenge as it’s mirrored in characters like Elloe and Miek. His search for his own humanity comes in conflict with his loyalty and his darker self, and eventually it leads him to try to do what he’s always done: remove himself from the situation and strike out on his own. Pak doesn’t give us any narration or inner dialogue to betray Hulk’s thoughts, and even his dialogue is sparse, but his actions show us everything. And I should mention the green guy’s attempt to separate himself from his allies leads to one of the best endings we’ve seen so far in "Planet Hulk." But something’s been bothering me ever since "Planet Hulk: Anarchy" began and I think I’ve finally put my finger on it. 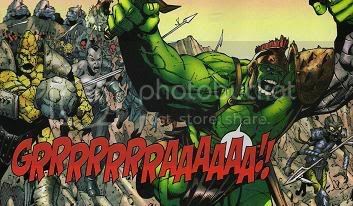 While it started out as a gladiator story, "Planet Hulk" has become a war epic, and with open war finally breaking out on Sakaar, I’m hungry as hell for the kind of big double-page spreads of battle scenes that saw so much overuse in CrossGen’s late titles. Obviously, pumping those pages out every issue didn't save CrossGen from drowning, but "Planet Hulk" feels like the kind of storyline that that kind of treatment could serve. I’m hungry for big, Brath-y, silent panels of nothing but swords, lasers, big freaking axes and blood, blood, blood! But I’m not putting that in the minus column just yet. I’m trusting that Hulk’s creative team is doing what the creators of CrossGen never learned to do: building up to the big moments rather than killing the effect by filling each issue with nothing but those scenes. And the fact that I’m so bloodthirsty for it is probably more of a testament to a skillful building of suspense than anything else. No BS. No pandering. It has been so long that I could say something like "I can’t believe I have to wait a month for the next issue!" about Hulk or any other comic for that matter. And it feels good.